We just sent ours! We can't wait to see the final slide show. Hi! This should be fun! Can you just take the images from our blog we had up today? We are not going to have our card ready till past the deadline. We'll send ours this week for sure! We can hardly wait to see all the star-studded kitties! 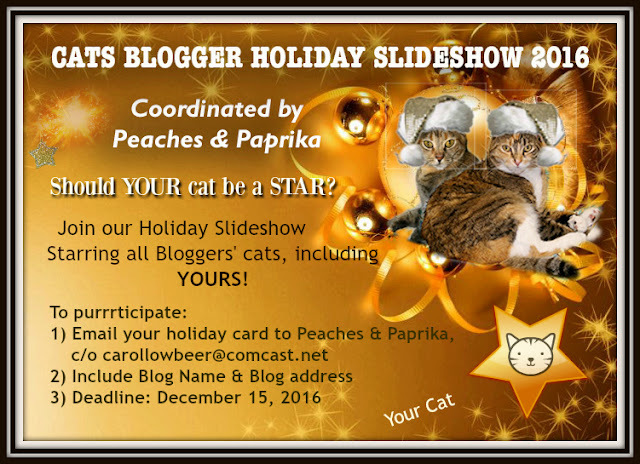 Darn, I haven't done our graphic yet but did blog about your lovely Santa Paws gift. ck, did you send a graphic for slideshow?? Hi Meezers, looking but your blog isn't coming up when I hit the link. Please send me your graphic if you have one: carollowbeer@comcast.net Also need your name and kitties name. Thanks. We can't wait!!! You are so kind to do this!! Oh, dear..that happened because I wrote that to you from my work. So sorry about that. I will send you them but will have to go on the assumption that they are too late. I have been so busy I have not even looked/commented on blogs this past week...not even my own!